“FIFA Fair Play”, the slogan used by the organizing committee of the World Cup to promote fairness. The word itself seeks to clear games from any controversy but can hardly be done. When the world expects the show to be centered on the 22 players on the pitch, it is often that we find the three extra men running around the field as the villains. Three of the first four games of the FIFA World Cup 2014 have been controversial because of referee decisions, but at least today the outcomes were fair. Yesterday Brazil got more than what they deserved with a penalty, a win and three points considering how well Croatia was playing until a bad call. Today, Mexico and the Netherlands beat their opponents fair and square despite some bad calls from those that try to keep a clean and fair game. At the “Stadium Das Dunas” El Tri had its World Cup debut against Cameroon, a team that almost forfeited from the competition but was considered dangerous based on its speed and physicality. The game showed just abit of those strengths but showcased a lack of concentration by the african team that was beat to it on every sector of the pitch. Then came the controversial calls. 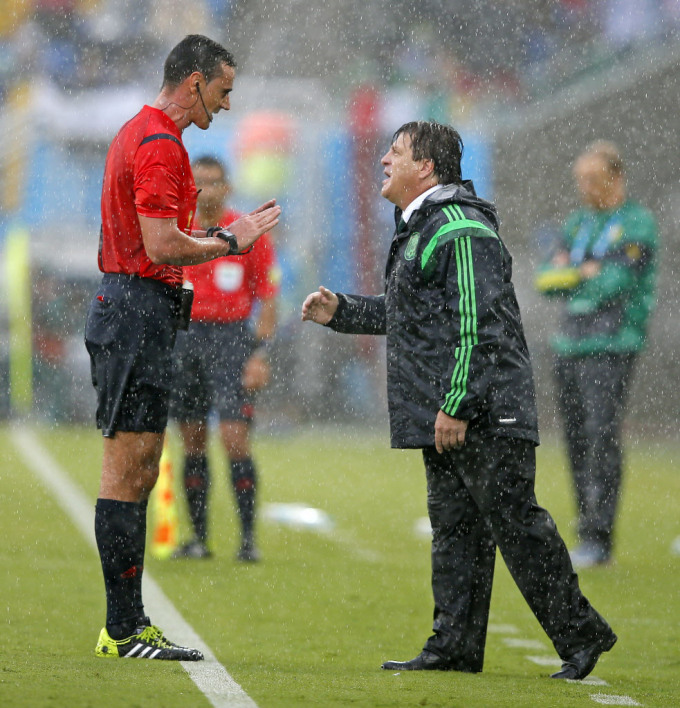 Two good goals by Mexico were called off because of “offsides”. Giovanni dos Santos could have tied Neymar as the leading goalscorer of the competition but Wilmar Roldan from Colombia decided to be the bad guy and along with his lineman Humberto Clavijo sent both teams 0-0 to their dressing rooms, when the score should be 2-0 in favor of the Aztec squad. But here is where the fairness came to play. Giovanni may have not found the net again in the rest of the game, but Mexico did. Oribe Peralta was in the right spot and at the right time to push a deflection by the African keeper to the back of the net. It took the team 60 minutes to finally see their efforts reflected on the scoreboard and it stayed that way until the final whistle was blown. It may not be a fair result, but it was a fair win. Not even two hours later, at “Arena Fonte Nova” a a rematch from the final of South Africa 2010 between Spain and the Netherlands was considered a must-watch game. Spain took advantage of a bad call from the judge Nicola Rizzoli who did not hesitate of calling a dive by Diego Costa a penalty Kick well executed by Xabi Alonso 30 minutes into the game. But after the 90 minutes were played Netherlands was too good and demolished the spaniards by five goals to one. A result that not even the winning team expected. But soccer was fair once again, to make it fair the trick was simple. When teams forget about bad calls and continue to play their game fairness will find its way into the scoreboard. We see it all the times when a team is devastated by a bad call and lets the opposing team take the win by forgetting about the game. Mexico and Netherlands did the right thing by continuing to play the way they wanted no matter what came out of the referees decisions. Referees have to run between 6 and 7.5 miles per game trying to be as close as 20 feet to the ball at all times no matter the rhythm of the game. That may sound hard but when you are getting paid around $30,000 to be at the World Cup, perfection should be expected. On the final match of the day Noumandiez Doue from Ivory Coast did not have much to do with a called deserved win from Chile over Australia 3-1.